Aiki otoshi techniques are commonly referred to as “blending drop” techniques. While not as commonly practised as other forms of technique, they have a long history in Aikido. In the below video Mike Jones Sensei from New York Aikikai demonstrates and provides instruction on the basic and advanced versions of Katate dori aiki otoshi. This form of aiki otoshi is practised from a same side wrist grab. 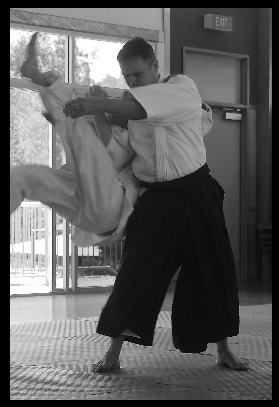 From a safety perspective, it recommended that the advanced form of aiki otoshi not be attempted except under the close guidance and instruction of an experienced instructor familiar with the technique, including how to receive it. How to safely receive Aiki otoshi as a uke? How to teach the ukemi for the technique? Correct form to lift and project the uke. The video was recorded at Aikido Warrior Dojo, Brisbane on 12 August 2015. In the below archive video R Crane Sensei (5th Dan) demonstrates the application of aiki otoshi from other attack forms typically seen in Aikido.